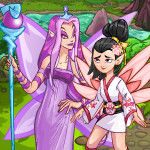 Spring has sprung in Neopia! With the arrival and departure of the Negg Fest, you’re probably wondering, what to do now? There must be more to this season than the hunting of decorative Neggs all over Neopia and… there is! Spring marks the blooming of flowers, cleaning and renewal, and having a brighter outlook after the dreary winter. So, open the curtains in your NeoHome, let in the shining sun, and get to spring cleaning! When you get any new items, they go directly into your inventory. Even though it is roomy, it really is only a bag you carry around, so you should keep it relatively empty. Although there isn’t a limit to how many items it can truly hold, you can’t purchase anything or accept gifts from NeoFriends if you have over 50 items. Additionally, suspicious characters like the Pant Devil, the Kiko Lake Team, and the Grundo Leader are known for relieving Neopians of their items, so it’s definitely better safe than sorry. Make sure you have an empty inventory, or add some Pant Devil Attractors if you have any valuables in your inventory. Your inventory will be lighter and you’ll be able to have room for new things! If you still have thousands of items in your Safety Deposit Box after this year’s Charity Corner, well… you either had a LOT of items to start with, or you may have slept through the donating excitement. Either way, now is the time to clear out. Most likely, you have no idea what has accumulated in there! Start by looking through what you have, deciding what you do and don’t need. Books can be read to your Neopets and other one-use items like stamps can be put in your album! This is a good time for pet and account improvement. Additionally, while you could always keep some of your items in there for next year’s Charity Corner, I bet there are a lot of items there you are better off selling! For example, if you battle at Battledome daily, you may find extra codestones in your SDB, which are easy sellers. You might surprise yourself with items that might’ve been hiding in your Safety Deposit Box for years. Limited edition items inflate over the years, so you never know which item might be worth millions now! Trade in your old items for new, shinier ones or just for some extra Neopoints. Now, it’s time to tackle that closet of yours. Don't try to deny that you’ve been collecting hundreds of various wearable items! After all, there’s nothing more fun than to accessorize and play dress up with your Neopets. But fashions come and go, and your closet should reflect that! Go through your closet and think about the look you really want for your Neopets, which items match the look, and which items are just sitting there and wasting away. After all, nobody wants an outdated wardrobe! If you have extra gift boxes from Trudy’s Surprise or Gift Box Mystery Capsules (for those NeoCash items), consider brightening a Neofriend's day with a little gift! Or maybe you can sell unworn Neopoint backgrounds and clothing items for new styles. Haven’t worn an item the past year? Maybe it’s time to let it go, just like letting go of the cold of winter. It’s spring now, after all. Trade in that Snowy Cottage Background for a Meridellian Spring Background! After a whole winter of you and your Neopets staying home from the cold, your NeoHome has bound to become a little messy and cluttered. Start by throwing out any garbage around the house. You don’t need all those Old Box Forts, empty Bottles of Water, or any half-eaten pizzas! Once you’ve cleared up a bit, you can start putting away winter items and setting up for spring. This means you can put your Heated Blankets back into storage and turn off your heater. You can also take this time to redecorate. Put away the Abominable Snowball Light Strings you still have from the winter and replace them with Spring Chimes. Set up a Pink Flower Bouquet as the centerpiece on the dining table. Swap out thick rugs like the furry Taelia Rug for lighter options like the Yellow Faellie Rug or Negg Rug. Spring is the perfect weather for gardening, so this is the perfect time to tackle your yard! You have been keeping it tidy during the winter, haven’t you? After all, the cold of the winter helps you start off with a clean slate. Clear off anything left over on your soil and start plowing! You can choose to make a farm, flower, or whimsical type of garden depending on what seeds you plant. Farm plants include Raspberry Bush, Olive Bush, and Rainbow Fruit Tree. You’ll get to produce edible foods when your plants have matured! You may be looking for just aesthetics though, so you’d be more interested in planting Rose Trees, Purple Hydrangea Bushes, and Yellow Holly Bushes. If you want to create a whimsy garden that inspires fantasy, consider Gurple Bushes, Mystery Island Tree House, and Heart Fruit Trees. Of course, you’ll need a green thumb for your garden to flourish, but with patience and compassion, your sprouts are bound to grow into a beautiful garden! Your shop will come in handy during your spring cleaning, but you have to keep it organized, too. For all the items you chose to sell, this is where you get to make a pretty penny and use those Neopoints to buy new things. Restocking your shop at least once a day will keep a steady flow of items going out, and profit coming in. Use the Shop Wizard (he’s a nice guy, but he does need break sometimes, so keep that in mind!) to price your items accordingly, or else they won’t sell and you’ll have items backed up. Any sales will go into your shop till. Maybe you'll finally be able to afford an item you've been wanting, and all you had to do was sell some of your unused items! Also, consider investing a little in increasing your shop size, so you can have even more items available for your loyal shoppers. That’s all from us, your spring cleaning guides, Kellian (k3l26) and Maile (sunshine482). There are so many benefits of spring cleaning, so get to it!